Back in April, the Library of Congress (LOC) and the National Archives and Records Administration (NARA) each shared a blog post detailing the similarities and differences between the two institutions. They were such great articles we thought we would share their insights and some of our own! 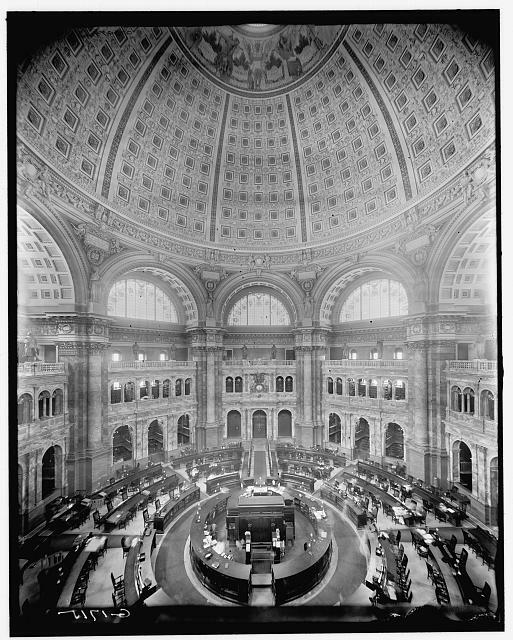 Library of Congress, Main Reading Room, Washington, D.C. published between 1900 and 1910. Since 1800, the LOC has been a part of the legislative branch of the federal government. Their mission is to collected all forms of knowledge and creativity from within the United States and around the world. They also act as the national copyright repository, holding all items registered for US copyrights. In addition, they operate offices throughout the world and receive materials through donations from private and group donors. Their holdings are not exclusive to United States materials. Established in 1934 as an independent agency of the executive branch, the National Archives is the “nation’s record keeper.” They gather, organize, maintain, and make available federal records created as part of running the nation. Their holdings are unique to NARA and cannot be found anywhere else. Their materials represent only 1-3% of all government records created, and yet that equals more than 10 billion records and counting! As the articles indicate, there are some fundamental similarities between the two institutions. First and foremost, they make historical materials accessible to the public at large. Anyone can visit the Library of Congress and request a book from their vast selection or pursue their online database. The National Archives also offers an open online database of materials, a main research building in the heart of D.C., and satellite archives around the country. Second, both institutions store and protect historical materials. All forms of communication from photographs, moving images, posters, emails, and various written documents are properly cared for and preserved for future use. The main difference between the two institutions boils down to this: the Library of Congress collects materials while the National Archives is a repository. Libraries create collections of materials sorted by topic and compete with other similar institutions for sources. Archives, particularly those associated with the government, receive their materials directly from agencies and organize based on the system established by the donating agency. What’s important to you as a researcher is how to use the archives. Sifting though the billions of items can seem daunting but there are a few strategies you can employ to make it more manageable. For those new to the Library of Congress, we recommend starting at the Digital Collections homepage. Here you will find a hub of sorts containing links to newspapers, sound recordings, photographs, oral histories, legislative materials, digital finding aids, and more. This is a great place to start exploring the library and will help give you a feel for how to navigate the online databases. We also recommend visiting the online websites for past and present exhibitions. These are particularly useful as trained historians and archivists have collected LOC items into usable and searchable databases, often with overviews. If you are interested in branching out a bit and exploring all the library has to offer, visit the full Online Catalog. Searching the National Archives is very different from searching the LOC. Their records are not organized by topic, but rather by federal agency. Searching their records requires a new strategy and a new way to approach online research. Think of the National Archives as a giant file cabinet. When agencies turn files over, NARA continues the agency’s organizational strategy employed for everyday use. When you are searching for a particular event, think of what federal agencies would be involved and use key word searches within those files. To begin your search visit their Online Public Access network and don’t forget to narrow your search by using the Advanced Search options. For a more detailed walk through of how to use NARA’s database, visit this blog article. You should also visit DocsTeach, an interactive website put together by NARA that provides document collections and lesson plan ideas for teachers. Use these hyperlinks to read the original articles from the Library of Congress and the National Archives. We’d love to hear about any treasures you find on your travels through the Library of Congress and the National Archives! This entry was posted in Historical Investigation, U.S. History and tagged archive, library, primary documents, research on June 5, 2013 by jbcosca.